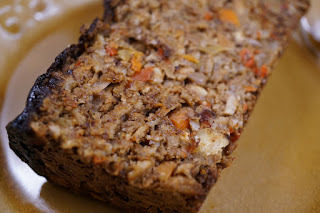 Here's an alternative way to make the Beanie Veggie Loaf in the PlantPure Nation cookbook p. 178 if you want to reduce the number of pans/bowls you use and NOT have to sauté the veggies beforehand. 1. Process whole grain toast in food processor for bread crumbs. Measure out 1 cup of breadcrumbs and set aside in small bowl. Store the extra crumbs in your freezer. 2. Do not clean your food processor out! Process walnuts in food processor into fine pieces. Set aside in the same bowl as the bread crumbs. 3. Do not clean your food processor out! Process onion, garlic, carrots, celery and red bell pepper into small pieces in the food processor. Placed in a large bowl. 4. Do not clean your food processor out! Process chickpeas in the food processor until they are in tiny pieces but not pasty. Placed in large bowl with chopped veggies. 5. Add flaxmeal/water mixture to the large bowl, along with the oats, bread crumbs, walnuts, seasonings, veggie broth, etc. 7. Bake for 50 minutes to 1 hour so veggies cook well and loaf is firm. Tent with foil halfway through (at around 25 minutes in). Let sit for 30 minutes before cutting into slices. NOTE: This veggie loaf can be made the day or night before you want to serve it. You can warm slices up right before you eat. If I start this recipe with cooked rice and cooked lentils that weren't cooked together, what measurements should I use?